340,500 UK businesses trade internationally and global demand for British goods and services continues to be strong. The Centre for Strategic and International Studies suggests that cyber espionage could cost 1.5% of a country’s GDP. The US estimates that the cost of counterfeit goods, pirated software, and theft of trade secrets and could be as high as $600bn. 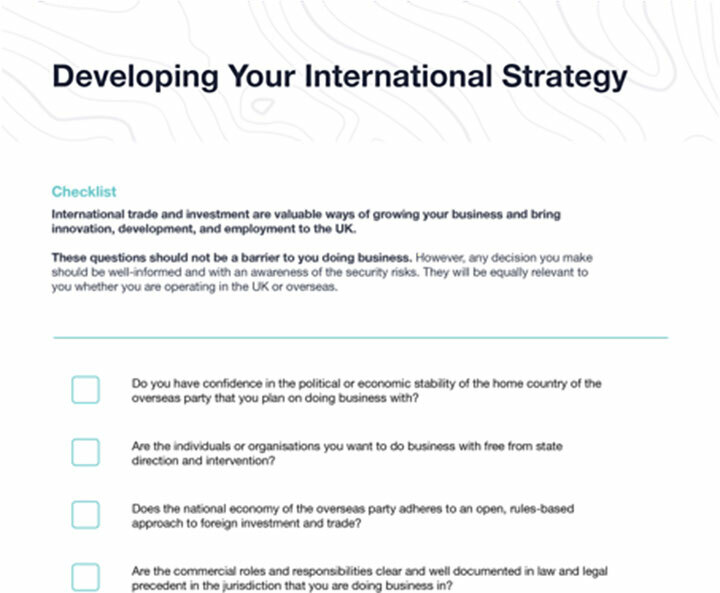 An open approach to international business and engagement should include measures to protect your long-term profitability, reputation, and the national security of the UK. Good governance and proactively considering security in business plans with overseas parties sets the tone of your risk appetite. Being aware of government’s business screening requirements will allow you to be mindful of any national security threats. Which risks can be mitigated? How can it be mitigated? Will it remain effective over time?